U... Rah... Rah... Wiiiscoooonsin. That's me singing varsity, not sure if you could tell. Anyways, the bye week has passed and the Badgers came out the way you would hope after a week off. Not only did they win big, but they posted their first shutout of a Big Ten team in ten years. So, after a 37-0 trouncing of the Boilermakers, it's time to hand out some grades. Scott Tolzien was a complete non-factor this week, although that seemed to be the game plan. He finished just six for thirteen with 87 yards. The only good thing about his game is that he didn't make any costly errors. The Badgers are a run first team, and they showed why on Saturday. Also, it was nice to see Curt Phillips get some extended playing time. He has a bright future with the Badgers and every little bit of in-game experience is helpful. Overall, you'd like to see better accuracy from your starting QB, but with Saturday's gameplan Tolzien didn't have to make plays, he just had to avoid mistakes and he did just that. Not a bad showing for Clay, he had 100 yards rushing at halftime. Throw in three touchdowns and you've got a pretty good game. It's important for him to get some confidence back after struggling in the second half of the Iowa game. Montee Ball and Erik Smith were able to get into the game and see some extended action, someone will have to step up their performance as a backup since there is no clear timetable for Zach Brown's return. Nick Toon is good, we know that. The Wide-outs didn't really have the chances to make too many plays but that 37-yard catch that Toon had was impressive. It wouldn't be a surprise if the Badgers have a similar run-first game plan at Indiana next week (and every other game for that matter). Tight Ends were another story in this game, most notably one Lance Kendricks. It's no secret that the Badgers love two tight end packages, and when you have a weapon like Kendricks you can see why. Kendricks carried the ball four times for 91 yards in Saturday's game. The Badgers rushed for 266 yards in the win. On a side note, Kraig Appleton needs to play more with the first team offense. 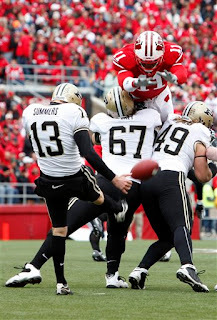 He can catch, and the Badgers need wide receivers who can hold onto the ball. Anytime you manage to rush for nearly 300 yards in a game, you're doing something right. You have to think this unit is happy that they've put Iowa and Ohio State behind them and now face less talented groups like Indiana, Purdue and Northwestern. If they can keep opening holes like those that John Clay had Saturday, it'll be an entertaining stretch run. O'Brien Schofield was quiet, but the rest of the Defensive line was not. 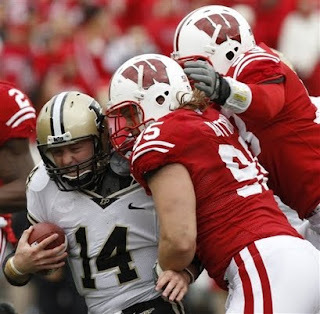 The Badgers held Purdue to less than 150 yards of offense, and it all started with the front four. Schofield didn't have a sack, but Patrick Butrym and Jeffrey Stehle did. Just a good all-around performance in the trenches. Mike Taylor was not missed this week. Between Blake Sorensen and Chris Borland the linebackers were just fine. Borland fell on a fumble and fellow 'backer Culmer St. Jean notched a sack. The linebackers were a big part of the reason that the Boilermakers only averaged 2.1 yards per carry. Jaevery McFadden stepped up big time as well. He seemed to be all over the field and led the team in tackles. No complaints about this group. What? A good grade for the secondary? Unheard of! But the much maligned group performed very well against the Boilermakers. A lot of that comes with the consistent pressure that the D-line put on the Purdue quarterbacks but when you hold a spread team to 81 yards passing you're doing something right. Coming into the game the coaching staff said they were going to stop rotating in corners and have two guys get the majority of the playing time. It seemed like Devin Smith and Niles Brinkley got most of the snaps and you have to wonder if that made a difference. Smith has shown some flashes this year and if this group comes together watch out. Phillip Welch got his act together, going three for three in his field goal attempts, he seems to have gotten his mojo back. Another blocked punt, this time by David Gilbert. That's two aspects of the special teams playing well. The Badgers really didn't get a chance to work on their kick returns, Purdue only kicked the ball off once, so we really can't say too much about that part of the game. What we did see from the special teams unit was good though. Everything went in the Badgers favor on Saturday. They had a clear game plan (run the damn ball) and executed it to perfection. The running game was powerful and consistent, the defense was dominant. If this is the Badger team we see for the remainder of the season they may not lose a game. Right on about Appleton. His hands looked like a vacuum the way the ball stuck in his grip. It'd be nice if Tolzien didn't have to hand the ball off to his receivers just to get them to catch it.